Citation Information: JCI Insight. 2018;3(23):e121062. https://doi.org/10.1172/jci.insight.121062. Immune checkpoint blockade (ICB) provides clinical benefit to a minority of patients with urothelial carcinoma (UC). The role of CD4+ T cells in ICB-induced antitumor activity is not well defined; however, CD4+ T cells are speculated to play a supportive role in the development of CD8+ T cells that kill tumor cells after recognition of tumor antigens presented by MHC class I. To investigate the mechanisms of ICB-induced activity against UC, we developed mouse organoid-based transplantable models that have histologic and genetic similarity to human bladder cancer. We found that ICB can induce tumor rejection and protective immunity with these systems in a manner dependent on CD4+ T cells but not reliant on CD8+ T cells. Evaluation of tumor infiltrates and draining lymph nodes after ICB revealed expansion of IFN-γ–producing CD4+ T cells. Tumor cells in this system express MHC class I, MHC class II, and the IFN-γ receptor (Ifngr1), but none were necessary for ICB-induced tumor rejection. IFN-γ neutralization blocked ICB activity, and, in mice depleted of CD4+ T cells, IFN-γ ectopically expressed in the tumor microenvironment was sufficient to inhibit growth of tumors in which the epithelial compartment lacked Ifngr1. Our findings suggest unappreciated CD4+ T cell–dependent mechanisms of ICB activity, principally mediated through IFN-γ effects on the microenvironment. 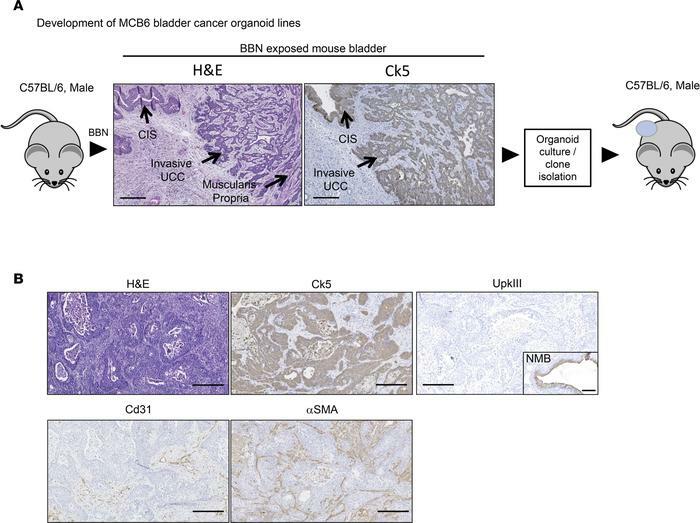 MCB6C is a transplantable organoid model of urothelial carcinoma, with features of human basal-squamous urothelial carcinoma. (A) Schematic representation of how the MCB6 organoid lines were established from a BBN-treated mouse. Images (original magnification, ×10) were obtained with NanoZoomer-XR. Scale bar: 200 μM. (B) Histologic and immunohistochemical evaluation of a s.c. MCB6C tumor collected 28 days after injection of organoid cells. A normal mouse bladder (NMB) specimen was used as positive control for UPKIII staining. Scale bar: 200 μM.